Interlaken: Skydiving the Swiss Alps — Serena Lalani. Skydiving has always been at the top of my bucket list, but not once did I ever imagine doing it 14,000ft above the Swiss Alps. That is, until my friend Sindy suggested it a few months ago. I decided to plan my Easter Break around my skydiving adventure. I headed to Montreux for the first part of the week while Sindy explored Geneva, Bern and Lucerne. We both wanted to see Interlaken and Zürich, so we saved that for last. For the second half of the week, we met up in Interlaken (a day before the skydive). Interlaken is located between Lake Brienz to the east and Lake Thun to the west. It is, hands down, one of the most beautiful cities I have ever seen. Seriously though, check out the colour of the water in the picture below. And the mountains, of course! Interlaken felt like a weekend getaway straight out of a movie. There were tons of chalets, cute restaurants and horse-ridden carriages. Having 2 full days in Interlaken was plenty of time - Even with one morning being dedicated to Skydiving. For majority of the first day, we walked around the city and sat near the lake. We were completely in shock by how beautiful everything was, so we ended up just starring in awe for hours. We took a cable car to Harder Kulm, otherwise known as the Top of Interlaken. The view from above was unlike anything I've ever seen before. When deciding what company to go skydiving with, our hearts were set on Skydive Switzerland. 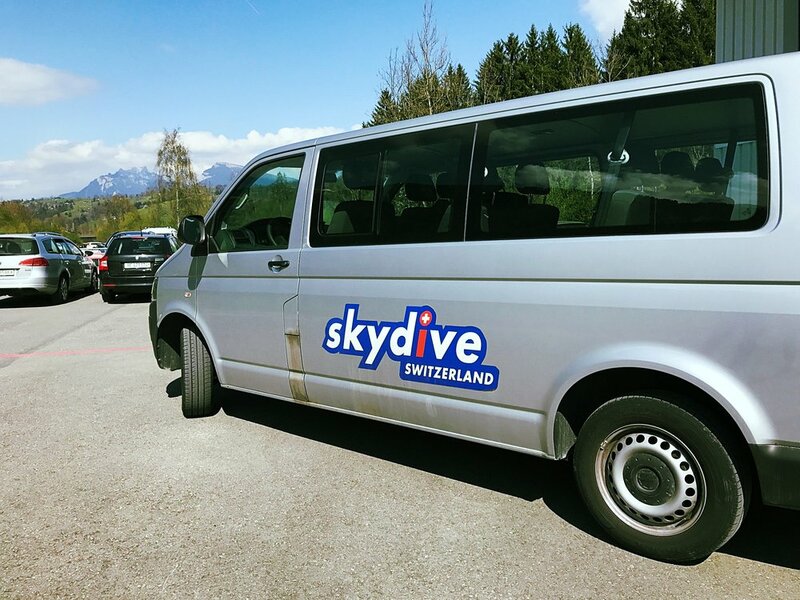 We looked into a few other companies but Skydive Switzerland had stellar reviews and although it was a little pricer than other options, we definitely did not want to cheap out on the safety of our lives. We booked our jump about a month in advance and we were given the option to start at 8AM or 12PM. Picking the earlier time slot is the best option because if any complications set in, such as weather or accidental overbooking (doesn't usually happen), then you are more likely to still be able to jump that same day as they can just move your slot to the later time. Luckily, we were in that situation and they managed to fit us in at 12PM. The pre-jumping nerves kicked in the night before when we were watching videos of other people doing the same thing we were about to do. A van picked us up from our hostel the next morning and took us directly to the airport where Skydive Switzerland is located. The staff that picked us up were friendly and caring and reassured us about the safety of their company. The pick up and drop off was included as part of the excursion which made things simple and efficient. Once we arrived at the airport, we were paired with tandem divers and given our suits. We were then instructed as a group how to position our hands and legs while jumping from the plane. The plane ride was just as fun as the actual skydive! The view from the plane window was absolutely incredible. The tandems were well educated on the location, altitude and atmosphere of our flight. They pointed out important sights and calmed our nerves. They gave us instructors prior to the plane door opening and made us feel safe the entire journey. Our free fall time was 45 seconds long and it went by much quicker than I thought it would. I was surprised to find that there was no "gut-dropping" feeling while falling before the parachute was pulled - In fact, it was actually relaxing. After pulling the parachute, Tim double checked to make sure I was feeling okay and started steering us towards some of the best views in Interlaken. He went out of his way to tell me about the city and the country while also ensuring that I was enjoying my experience. As for how it felt to be soaring through the air directly above the Swiss Alps, the only way I can describe it is life-changing. Free falling gave me a new appreciation for everything I have conquered and the beauty of our planet. 1) Don't cheap out. If you're strongly considering skydiving, make sure you do your research. Call companies that you feel would be suitable for your experience to determine costs and compare them. Sometimes the cheaper companies won't give you the safest/most enjoyable experience. Also, take into consideration the cost of photos and videos. 2) Pick somewhere with a worthwhile view. Majority of the whole 'skydive' experience is the part spent floating through the air - If there's nothing to look at then it probably won't be as exciting. 3) Just do it. Why not? If you have any questions about skydiving in Switzerland or skydiving in general, feel free to comment or message me! A special thank you to Tim and Skydive Switzerland for the experience of a lifetime! You can check them out here.